Born: February 21, 1886 in Chelsea Ma. 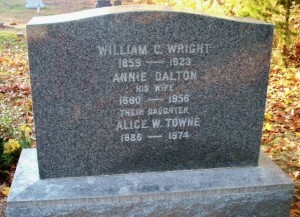 Died: January 20, 1974 in Bourne Ma. at 88 yrs, 10 mos, 29 d.
To: George William Towne; (1885 – 1965) (George Moody Towne & Annie Wallace Cruckshanks); George married (2) Ruth Caroline (Norris) Harvey (1886 – 1939) (Lucian W. Norris & Effie L. Osgood) in Yucatan Mexico on January 30, 1926 & married (3) Cecile Marie (Byrnes) Holmes (Joseph Byrnes & Winifred McDonnell) in Dauphin Pa. on June 18, 1945. 1. Virginia Wright Towne Byrne; (September 23, 1915 – January 12, 1999); Married Peter Joseph Byrne (1908 – 2002) (Thomas Byrne & Anne McHugh) in Brookline Ma. on June 13, 1959; Peter married (1) Mary Murphy (1908 – 1991) (Bartholomew Murphy & Mary (–)) in Bronx N.Y. on February 2, 1932. 2. William Wright Towne, WW ll; (November 19, 1916 – March 27, 1990); Married Katherine Agnes Porter (1916 – 1988) (John T. Porter & Bridget Agnes Sullivan); William & Katherine are buried in Massachusetts National Cemetery in Bourne Ma..
3. Edward Stickney Towne, WW ll; (October 25, 1918 – April 22, 1984); Married Veronica Kathleen Dwyer (1917 – 2014) (James Joseph Dwyer & Johanna Madeline Quinlan) on Abt.1942; Edward & Veronica are buried in Pocasset Cemetery.